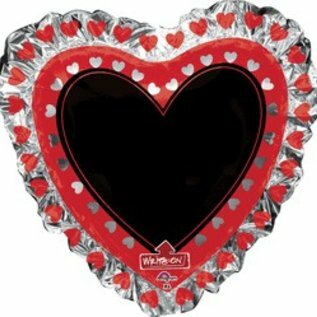 Home / Heart Write On Balloon 32"
The possibilities are endless with this dry-erase ballon! Marker included. It is a personalized message board. Giant silver and red heat with a black center. This is a Write-In Balloon. Write what ever is on your mind in the black center with the included white marker. I love you!, Will your marry me?, Kiss Me!, or anything else.